The employee was fired for making these statements and he filed a grievance. 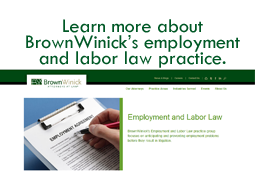 The union filed an unfair labor practice charge against the employer alleging that the employee was discharged for exercising his Section 7 rights under the National Labor Relations Act (NLRA). The matter was submitted to an arbitrator who found that the employee made both statements, that the comments violated the employer’s harassment policy and denied the grievance – determining that the employee was terminated for “just cause.” The matter went before an administrative law judge (ALJ) who found that the arbitrator’s decision went against the NLRA. The ALJ decision was appealed to the National Labor Relations Board (NLRB). The NLRB agreed with the ALJ and found that the discharge for the racist comments was in violation of the NLRA and ordered the employer to reinstate the employee with full back pay. The case is currently pending in the U.S. Court of Appeals for the Eighth Circuit. requiring employers to reasonably accommodate applicants' and employees' sincerely held religious practices, unless doing so would impose an undue hardship on the operation of the employer's business. Title VII is enforced by the U.S. Equal Employment Opportunity Commission (EEOC), as well as through claims brought in court by private litigants. Employers violate Title VII by requiring employees to work in a racially hostile environment - even if the behavior occurred on a picket line. WHAT TO WATCH: If one were to wager on this match, Title VII is the contender. The Eighth Circuit is the same court that found behavior on a picket line may constitute a racially hostile work environment under Title VII.